Filling the food gap in African cities isn’t about making sure there are more calories in circulation, but about understanding how poverty expresses itself through people’s relationship with food. If we don’t tackle the social, economic, political and geographic forces that shape people’s food choices, our cities will continue to leave many of our poorer neighbourhoods hungry, heavy, and sick. The “hungry season” arrives in January for widow Anesu Mukwanda (not her real name) and her nine children, mostly because of the cost of school fees. She lives in Kitwe, Zambia, and, like so many living on the breadline in Africa’s cities, her’s is a story of daily trade-offs: should she spend what little money she has on food for the family today, or should she pay the school fees, knowing that educating her children is a form of insurance against hunger later in their lives? After all, an educated child will eventually be able to find a job and support the family. The notion of the hungry season comes from a time when society was mostly agricultural and living primarily off the land. If the previous year’s yield was abundant, and this year’s harvest came in on time, then people would have plenty of food in their pantries. But if the previous year’s crop was poor, or this year’s rains arrived late, food stocks would run low and the lean season might stretch on as people waited for their crops to ripen. The reality is that by 2030, half of Africa’s people will be living in cities and no longer at the mercy of the types of natural events that once brought the hungry season to rural farming families. City dwellers live in an environment where the modern food system keeps a steady flow of calories moving into their neighbourhoods most of the time. Yet the hungry season still stalks many urban homes. Only it comes at different times of the year, and for different reasons. Understanding what brings the lean times to city-living families is key if countries hope to fill the hunger gap in their fast-growing cities, according to new research by the Consuming Urban Poverty (CUP) urban food security team, a collaboration of researchers housed at the University of Cape Town’s African Centre for Cities. The CUP team spent three years zooming researching in cities like Epworth in Zimbabwe, Kitwe in Zambia, and Kisumu in Kenya to better understand the link between food, hunger, and poverty in this kind of African city context. Most of Africa’s growth is likely to happen in ‘secondary’ cities just like these, meaning their municipalities will be at the coalface of the continent’s development challenges, as well as its opportunities, including in the area of food, nutrition and health. Tomatoes & Taxi Ranks, which expands on the CUP teams’ findings, isn’t so much about the food that’s circulating in these cities, but about how urban poverty expresses itself through people’s relationship with, and access to, food. The story of Anesu Mukwanda is typical of so many people who are struggling to make ends meet in today’s cities. For cash-strapped families, their daily lives are a constant set of trade-offs as they try to make their tight budgets stretch to meet the costs of everyday life: money for transport, for wholesome and nutritious food, for school fees, for rent, or cooking fuel or electricity. Can they afford to live in a neighbourhood that has reliable water services, or can they buy the kind of kitchen appliances that allow them to keep their food clean, safe, and refrigerated? The hungry season for an African city dweller comes whenever cash runs low: in the last week of the month for a wage-earner; in the gap between jobs for a piece-meal worker; in the days when business is slow for someone trading informally on the pavements near the local taxi rank; on those days when poor health leaves someone sitting in a clinic waiting room instead of turning up for work. The CUP research shows that when the hungry season arrives, people will all too often choose to cut back on healthy food like meat or vegetables, opting for the cheapest foods which are usually highly processed and nutritional dead. This is often industrial in nature and more food-like than food, and while it may settle the immediate discomfort of hunger, it won’t give them good longer-term nutrition. If people are skimping on nutritious food in order to make ends meet, how does that keep families mired in poverty, though? For babies, a shortage of proper nutrition can shadow them for their entire lives. The first 1,000 days of a child’s life – from the moment of conception, until he or she reaches about two years of age – is when most of their brain development happens. Without the right vitamins and minerals in this time, for the mother, while the child is in utero and during breastfeeding, and for the child after weaning, the brain won’t grow to its full potential and will always remain underdeveloped. No amount of good nutrition later in life will repair the physical and cognitive stunting to the brain. The child will end up with a lower IQ than he or she had the potential to achieve, will do less well in school, and will also be less employable as an adult. The upshot of this kind of early childhood undernutrition, according to the World Bank, is that it can reduce a person’s earning potential by as much as 10% through the course of their life. This will have implications for their ability to provide for their own family one day. For adults, the burden of this kind of undernutrition – which may mean plenty of calories, but not enough vitamins and minerals – results in general physical and brain stunting, a compromised immune system, cognitive underdevelopment, anaemia, fatigue, depression, or osteoporosis, depending on what nutrients are missing from the diet. Relying on a diet of cheap, highly processed, energy-dense foods that are largely nutritionally dead also results in weight gain and obesity, as well as a range of chronic diseases – heart disease, certain cancers, and diabetes and its associated illnesses, for instance – that are a huge drain on a family as they lose productive work days while they treat their illnesses. The answer to filling this urban food gap isn’t to expect poor people to grow their own food – city environments and economies don’t lend themselves to the kind of urban food gardening that policy makers often think will be the solution to urban hunger. If people are going to keep themselves well fed and properly nourished, they need to have a predictable and ample source of income in their homes, be it from a job, a small business, social grants, or community lending schemes. They need to have good municipal services in their neighbourhoods. They need clean, working kitchens. And they need affordable, nutritious, diverse foods on sale in walking distances of their homes. 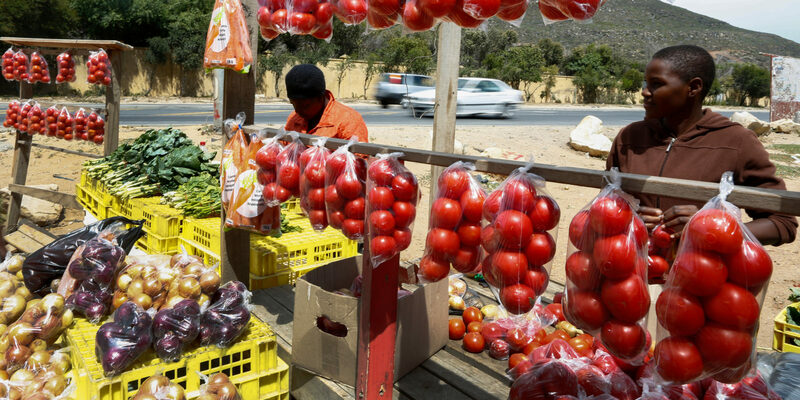 Science writer Leonie Joubert teamed up with the University of Cape Town’s African Centre for Cities urban food security researchers to write Tomatoes & Taxi Ranks: running our cities to fill the food gap. The book is available for download on www.tomatoesandtaxiranks.org.za and is written for anyone concerned with creating sustainable, fair cities on our continent. This article was funded by the African Centre for Cities.